We’ve all been there. A euphoric bike ride suddenly turns into a heart-racing, adrenaline-surging moment of terror as a car passes within inches, or makes a sudden right turn in front of our path, making us wonder why we have to share the road with these multi-ton behemoths. At the 2018 National Bike Summit’s federal policy workshop, safety from distracted and aggressive drivers — and yes, even self-driving cars — was a dominant theme. Caron Whitaker, the League of American Bicyclists’ Vice President for Government Relations, told attendees at the workshop that with the current federal transportation bill expiring at the end of 2020, the group is starting to think about what it wants to ask for in the next one. 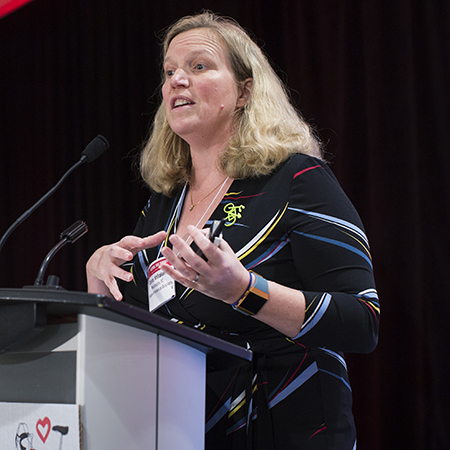 She said that surveys with members, advocacy group leaders, and officials at the Association of Pedestrian and Bicycle Professionals show that the top concerns are connecting networks; reducing distracted driving; and education for cyclists and drivers. Cyclists in the room echoed those concerns. A woman from Miami, where cycling fatality rates are among the highest in the nation, said that attempts to change drivers’ behavior can only go so far. Sometimes government agencies won’t go the extra mile to put up protected barriers. Another woman at the workshop noted that some transportation departments are content to separate drivers and cyclists by simply “slapping a white line” down on the road. We all know that some drivers are as good staying on their side of the line as a toddler is at staying inside the lines of a coloring book. The woman called for federal standards that would push state and local governments to do right by cyclists. But a sympathetic official from the Federal Highway Administration noted that President Donald Trump has issued an executive order directing federal agencies to eliminate two rules for every new rule proposed. “So there’s a structural challenge” under the regulatory philosophy of the current administration, the official said. She said a more practical route is getting guidelines in the American Association of State Highway and Transportation Officials updated bicycle guide, which engineers rely on. Distracted drivers were another point of discussion, as was a potential solution: driverless cars. After all, without a driver, there’s no one to be distracted. The danger that self-driving cars poses was underscored recently with the death of a 49-year-old pedestrian who was walking a bicycle across the street in Tempe, AZ. That prompted the League to urge its members to contact their Senators, and insist that automated vehicles be required to pass a vision test — and prove they can detect and bicyclists and pedestrians. Whitaker noted that some car and bike companies are looking at vehicle-to-vehicle communication between cars and bikes. She said that the League has concerns about that, especially if it means that driverless cars can’t recognize cyclists who don’t have the technology. 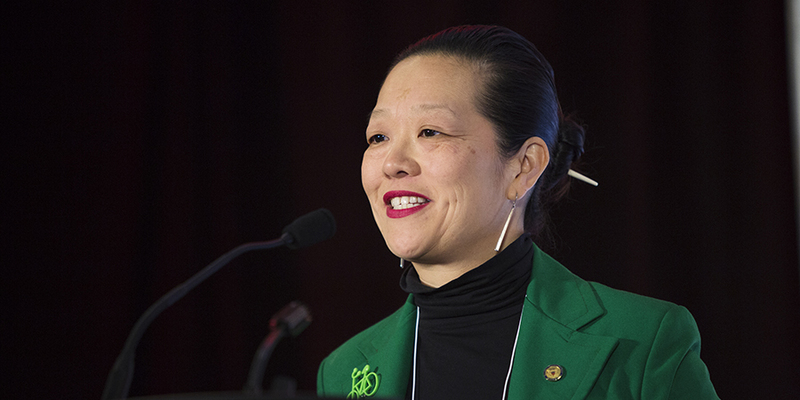 Bella Dinh-Zarr, a member of the National Transportation Safety Board, also acknowledged concerns about the ability of autonomous cars to recognize cyclists. “We are keeping a sharp eye on it,” said Dinh-Zarr, a cyclist herself, in a speech to the Summit the next day. Another issue that came up at the federal policy workshop was the possible return of congressional earmarks, in which lawmakers can direct spending on specific projects. Whitaker said that the league did “really well” in the age of earmarks, and noted that it was easier for a member of Congress to push for a specific project than a large transportation program. “If earmarks come back, I’m not saying don’t try to get an earmark, but I don’t think it’s the best strategy for us, moving forward, as a movement,” Whitaker said. Frederic J. Frommer, an avid cyclist, is the head of the sports business practice at the Dewey Square Group, a Washington, D.C., communications firm.